The new WildPeak M/T is the most aggressive and durable off-road tire that Falken has ever built and was designed to withstand the rigors of hostile terrain, be it on pavement, mud, snow or rocks. Step-down supports on the center tread blocks provide pattern rigidity in the contact area for enhanced stability and handling while preventing stones from becoming trapped in the tread grooves. Large shoulder lugs offer added sidewall protection against puncturing and greater off-camber traction on loose terrain. Falken Tire's proprietary Duraspec Three-Ply Sidewall provides outstanding durability and features two high ply turn-ups for an added layer of protection. The lower sidewall features heat diffuser technology which protects internal tire components and ensures vehicle stability when towing or carrying heavy loads. 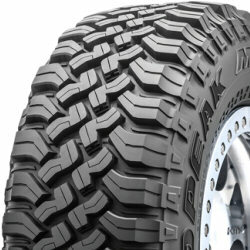 The tread is optimized with three variable pitch positions to provide a quiet ride as compared to other offroad tires. Built-in stone ejectors help prevent stone retention and puncturing and also allow the tread to shed mud to prevent loss of traction. The WildPeak M/T is available in LT metric and flotation sizes from 15-20 inch wheel diameters.